Here are three things we just learned about the connection between the National Enquirer and Saudi Arabia: 1) The National Enquirer’s parent company, AMI, asked the Department of Justice if they needed to register as a foreign agent after they did an unusual, long glossy PR-type piece on Saudi Arabia and the Crown Prince. 2) The National Enquirer was seeking to do business in Saudi Arabia, and they were hoping a business deal could bring in some badly needed cash; and, finally, Jeff Bezos felt that there was a Saudi Arabia connection to the National Enquirer’s attempted blackmail of him. 3) Then, today, according to Ari Melber of MSNBC, the National Enquirer is a billion dollars in debt; and the feds are investigating whether the National Enquirer illegally acted as an agent of Donald Trump. 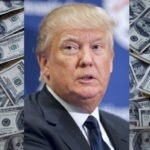 That means that while Donald Trump was desperately seeking hundreds of millions of dollars in loans from Deutsche Bank, and Jared Kushner’s father was asking the Qatari government for financing, the National Enquirer, a third Trump-related business was seeking a cash infusion from Saudi Arabia to offset its billion dollar debt. Even more explosive: The feds are reportedly investigating if the National Enquirer was simultaneously acting as a foreign agent of Saudi Arabia, and illegally acting as an agent of Donald Trump. Let that sink in!